The contents of the “Feature Article” page are provided to you for your entertainment, amusement, and perhaps information. Here you may find articles of interest, pictures, historical information on the Club, or whatever shuffles to the top of the pile on our desk. Thank you for visiting, and please stop by again. WHERE DID THE ALLIS CHALMERS COMPANY COME FROM? 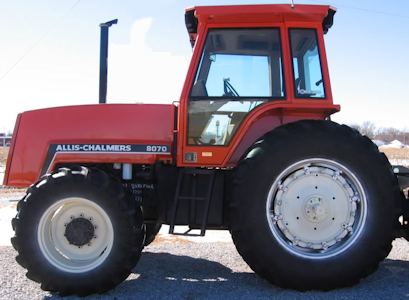 The Allis Chalmers Company was the result of a merger between 3 other companies. Allis purchased (some sources say with 2 partners that didn't last long) ) the Reliance Works in Milwaukee in 1861 at a sheriff's sale and subsequently renamed it. Started in 1847 by Charles Decker and James Seville, the Reliance Works consisted of a foundry and machine shop. It manufactured millstones and by some accounts many more products including, sawing machinery, grist mills and other heavy equipment. 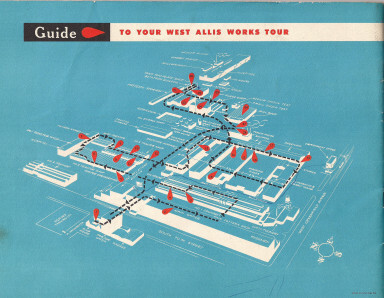 When Allis acquired it, the work in the shop was primarily repair and odd jobs. He turned the venture into a very successful business manufacturing steam engines, mill and mining equipment. The companys sales catalog was quite impressive By the time Allis Chalmers was formed Edward P. Allis had been deceased for almost a decade and the company was ran by his son, William James Chalmers. The Fraser and Chalmers Company was founded by Thomas Chalmers in 1872. 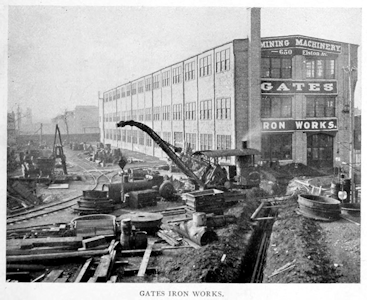 Thomas immigrated from Scotland in 1842 and for at least some period of time was employed by Gates Iron Works(below). 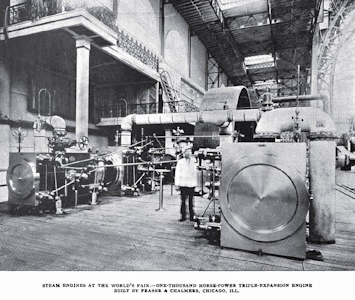 Fraser and Chalmers manufactured steam engines, pumps, and mining machinery and by the 1890's had worldwide sales, manufacturing capacity in England and employed about 1000 people in Chicago. Gates Iron Works (founded by P. W. Gates) in Chicago made plows, wagons, and flower milling equipment in their foundry and blacksmith shops. Thomas Chalmers worked for Gates in the mid 1840's and the Chalmer's family was apparently involved to some extent in the business which eventually expanded to include the manufacture of rock and cement processing equipment. Gates reportedly built the first steam operated sawmill in the country. In 1901 these three companies joined to form the Allis Chalmers Company. 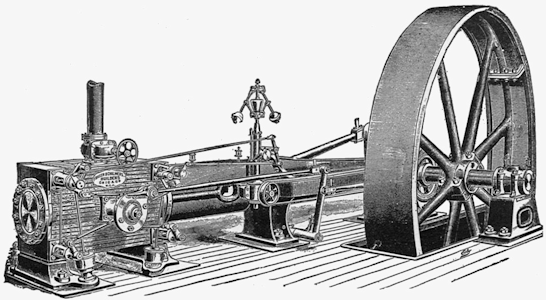 Shortly after the merger the newly formed venture aquired the industrial engine portion of Dickson Manufacturing. 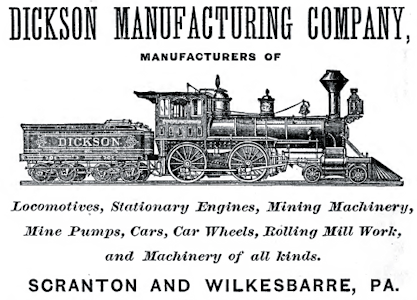 Incorporated as Dickson Manufacturing in 1862, by the 1890's Dickson was manufacturing steam engines, locomotives, internal combustion engines, blowers and compressors. The locomotive portion of Dickson became part of the American Locomotive Company. Charles Allis (another of Edwards sons) had purchased a hundred acres of land west of Milwaukee in an area known as Honey Creek in 1900 and by 1902 AC had started a large factory there. In May of that year local residents voted to incorporate the area as a village named West Allis. 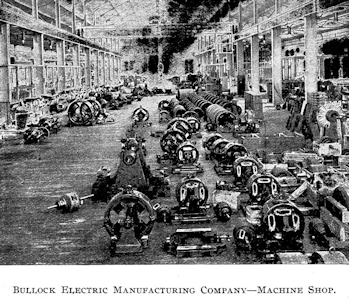 Within a couple of years AC aquired Bullock Electric Manufacturing Company in Norwood Ohio which added electrical products to it's manufacturing capabilities. 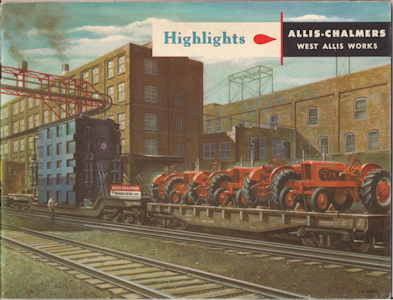 Allis-Chalmers manufactured a wide variety of steel processing, mining, sawing and power sources in addition to electric components, pumps, tanks, boilers, blowers, turbines, compressors, pipes, valves, sieves, and conveyors needed for these products. It also supplied consulting, installation and training services for it's customers. 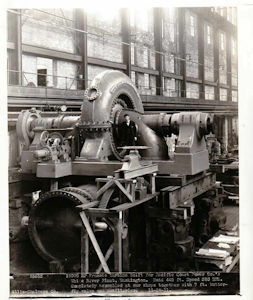 CAPTION SAYS THIS IS A 10,000 HP TURBINE MANUFACTURED IN 1911 FOR A POWER PLANT IN WASHINGTON STATE. By 1912 the company found itself in financial trouble, was reorganized with a new name (Allis Chalmers Manufacturing Company), and a new manager was brought on board to turn the company around. Otto Falk saw what was happening in the moderatizion of agriculture and the first Allis Chalmers tractor was conceived in 1914. Over the years AC acquired many more businesses becoming a major player in agricultural, electrical, construction, mining, milling and other equipment markets around the world. It has been said that "AC was a conglomerate before the word was coined". It absorbed many of the famous names in modern agricultural history as well as other industries. Like many other large manufacturing companies, AC played a major role during the war years including work on the Manhattan Project. At one time it was number 54 on the Fortune 500 list and employed as over 30,000 people. It boasted 8 large manufacturing plants in the US and Allis Chalmers products were built in 6 foreign counties. It had several smaller parts plants, a proving grounds, a major share of the agricultural market and sales envied by many of it's competitors. 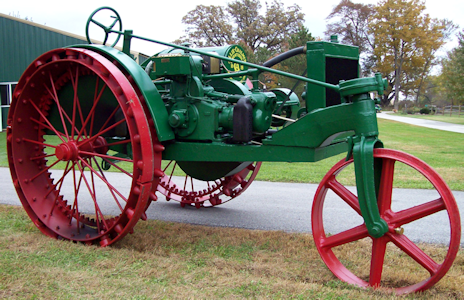 Tractordata.com credits AC with having produced 103 different tractor models, http://www.steel-wheels.net/allis.html has a great history of the early tractors and http://www.allischalmers.com/serials.html has a lot of good information about AC tractor production through the years. But, with the exception of continual change and gravity, nothing seems to last forever. Economics and tough competition came knocking in the 80's and by 1985 AC was losing millions of dollars a year having to dispose of major portions of the business to pay the bills. Over the years AC manufactured many thousands of tractors with the last being the 8000 series. The orange era officially and sadly ended in 1985 with the farm equipment business being sold to Duetz AG of Germany and the name being changed to Duetz-Allis. (Duetz-Allis roots can be traced to a company formed by Nikolaus Otto, inventor of the four-stroke internal combustion engine) In 1990 Deutz-Allis executives bought the North American portion of Deutz-Allis and renamed the company Gleaner Allis Corporation. The name was soon rearranged to Allis-Gleaner Coporation (AGCO). AGCO has since acquired several more companies becoming a significant player in the very tough world agricultural equipment market. With around 20,000 employees, and some 3000 independent dealers and distributors in 140 countries they have been a fortune 500 company for 15 years with net sales of $7.5 billion dollars in 2015. 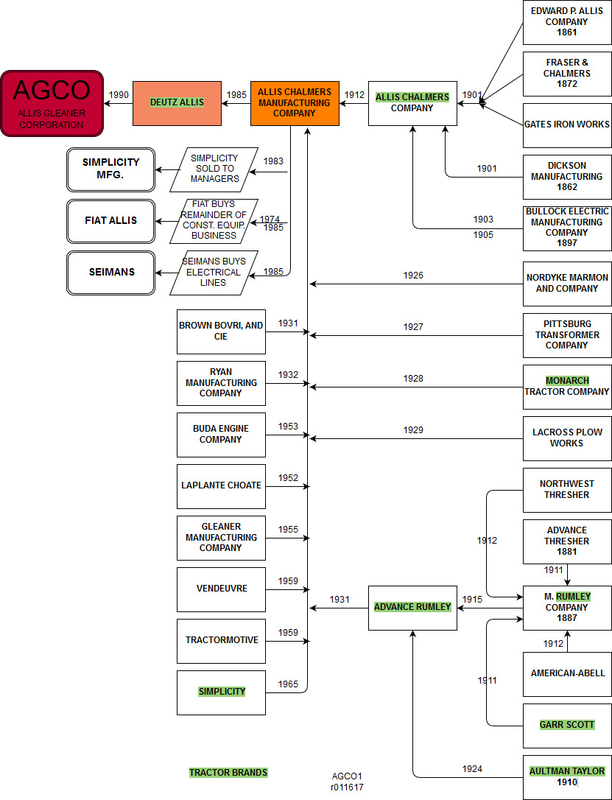 Below is a chart showing companies (many of them dear to us) that have been involved in the long history of Allis Chalmers. In a future articles we'll have more about AGCO and also CNH. Between them they have absorbed many of the old tractor companies.